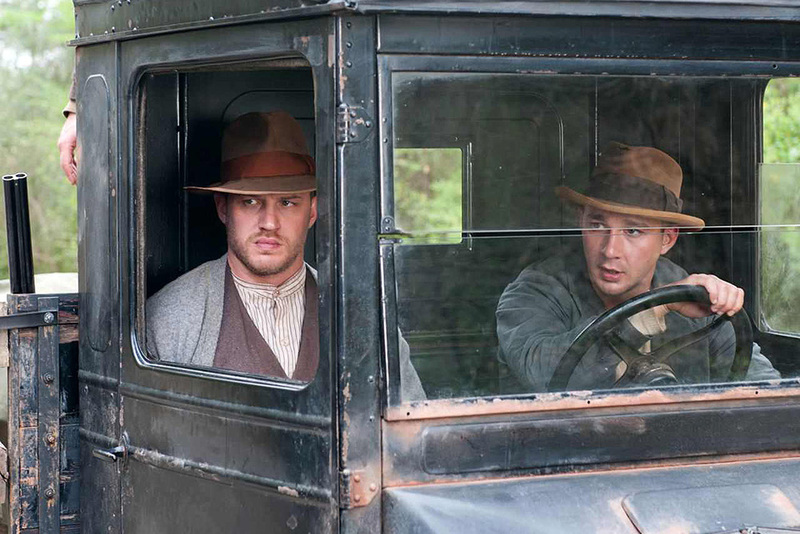 Lawless, distributed through Roadshow Entertainment, hits Australian cinemas this Thursday, October 11. Lawless is an adaptation of The Wettest Country in the World (2008), written by Matt Bondurant based on the bootlegging activities of his grandfather Jack and grand uncles Forrest and Howard. Directed by John Hillcoat, his first film since The Road in 2009, this violent exercise boasts an unbelievable ensemble of actors and tells the tale of the three brothers – played respectively by Shia LaBeouf, Tom Hardy and Jason Clarke - who utilize their bar for illegal activities including moonshine manufacture and distribution in prohibition-era Franklin County, Virginia. When Special Deputy Charley Rakes (Guy Pearce) arrives in town he pays the brothers a visit, informing Forrest, who heads the operations, that he intends to shut down all of the county’s bootleggers. When Forrest refuses, Rakes starts a violent shakedown, and when things get personal, a war commences. Lawless is plagued by dull narration, which is smugly nostalgic and glorifying, clunky pacing, a pair of pointless (not to mention preposterously unbelievable) romantic subplots and a lack of tension in what should be its draw card - it’s gun-toting. But the biggest flaws of all are in the irately unlikable and thinly drawn characters and the underwhelming cast. While there are glimpses of the talented filmmaker who helmed the fantastic adaptation of Cormac McCarthy’s The Road and the award-winning The Proposition (also penned by screenwriter Nick Cave) this all feels too familiar and Hillcoat makes some baffling decisions. Most of the cast is wasted. It’s as simple as that. Gary Oldman appears for five minutes at most and Jessica Chastain is written a character who is given nothing to do (or say). For two charismatic performers there was next-to-no chemistry between Chastain and Hardy, and their romance emerges out of nowhere. Mia Wasikowska, who plays Jack’s romantic interest, is so overtly Christian and pure (and forcibly unobtainable) that Hillcoat makes the head-scratching decision of introducing her petting a baby deer in one scene. She serves little purpose to the story other than exist as a late plot device. Lets be honest, Hardy’s performance was ridiculous. While I admired that his cardigan-clad tough guy (there are rumours around the county that he is immortal) was a man of few words and liked to let his actions speak in their place, his grunting responses seemed to be a misguided source of humour. It is probably the weakest performance from a man who has not yet put a foot wrong. Just when I thought there was going to be a ballsy turn in the middle that might have rekindled my investment, the turn of events resulted in the film losing me further. Pearce, in a performance so forced and over-the-top it is hard to take seriously, portrays a man I am surprised is not more maligned. As an effeminate, fragranced, sharply tailored, but motiveless law enforcer he, for me, was nothing more than a poorly conceived caricature. I might be alone here but the best in show was the promising Dane DeHaan (Chronicle), as Cricket Pate, their moonshine manufacturer. DeHaan effectively gave his character – a pawn for manipulation - surprising depth. Lawless has impressive costume and period set design and is well shot by Benoit Delhomme (The Proposition) and some of the soundtrack, courtesy of Cave and Warren Ellis, is excellent. If it wasn’t clear in The Proposition, Hillcoat knows how to capture violence and here there are several scenes where the blood runs thick that prompt you to prepare for the worst. LaBeouf tries hard all the way, but when we are asked to be emotionally involved with a character so unlikeable (the completely unjustified sense of swagger and self-importance that he carries with him for the second half), it is hard to invest. With Hillcoat at the helm Lawless aims high (Cannes premiere and all) and with a stellar pedigree and a gritty, dusty, violent, prohibition-era setting the potential for this family-fueled revenge tragedy was limitless. Disappointingly, it is astoundingly average and falls as flat as the hair on the head of Pearce’s ridiculous villain. Wow, I never expected you to hate it so much. I understand where you're coming from, but I quite liked it and I do think Hardy did a good job, so did Pearce. I agree that Hillcoat definitely knows how to capture violence, some scenes were gruesome! Too bad you didn't seem to enjoy it at all! I fell asleep twice ... during the trailer.